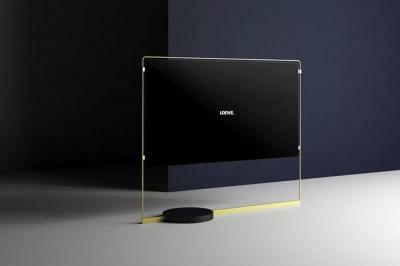 Loewe's Bild X is a modular high-end OLED TV that uses a WRGB OLED Panel suspended in a stainless steel frame using magnets. The TV can be hung on the wall or it can be placed on the floor (and then it needs a support which can be a black marble disk or a cross-shaped steel one). The Bild X is in final development, and may be released by the end of 2018, Loewe is not ready to commit yet.